Guus Hiddink has left the door open for a return to Chelsea after refusing to pledge his future to Turkey. Chelsea captain John Terry has already revealed he would welcome the appointment of Hiddink and that all the players would be happy to see the Turkey coach back in West London. Hiddink admits he was happy to hear that Terry would like to see him return to Chelsea. "That, I understand. 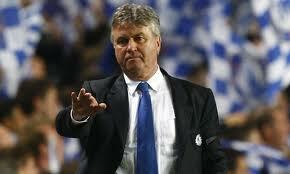 I had a beautiful time there," said Hiddink. Speaking after Friday's draw with Belgium, he did not confirm he would still be at the Turkey helm for their Euro 2012 qualifier with Kazakhstan in September. "I'm not, at this moment, in that position, I always like to be very clear. I can formally say I have a contract until 2012." The 64-year-old has an opt-out clause in his contract with the Turkish football federation and he could use this if Chelsea come calling.